Woke up before dawn, just a little lighter, waited until it was light enough to see without my headlamp. Had my traditional breakfast with a Starbucks Via Caffe Mocha. I have the same breakfast everyday and don't seem to get tired of it. I get moving before the sun rise. Strange day today . Lots more clouds than before. The sunrise happened behind the clouds and the clouds were behind a mountain. I left my camp and climbed up the trail which climbs about seventy five feet up from the ground to the top of the lava. The lava is black sharply shaped rocks jumbled atop each other. The lava flow is about seventy feet thick here. Less thick in other places. There are dips and places where the lava has a low spot. Down about twenty feet to more lava below. The rocks are jumbled in such a way that there are crevices and gaps that go down who knows how far. Deep enough that this would be a great entrance to the Orc kingdom. The trail meanders across the flow following the high points. The trail is crushed lava rock and is semi-level. It would be impossible to hike across this lava without a trail. The rocks are too sharp and jagged and tilted in all kinds of crazy directions. I stay on the trail. Parts of it are hard enough to walk on. With rocks poking through to trip over and cobbly lava in places. I follow the trail to the highway, then again on the other side. I follow it past the trailhead where there is a water cache for careful hikers who plan ahead. I pass it because I currently have plenty of water. The trail drops into an island of trees and sand in the middle of the lava. A place where it's easier to walk. It climbs up across it. I could have camped here had I known about it. On the far side of the island I climb back on to the lava and wind up and up and up closer and closer to the crater where this lava came from. As I climb the breeze picks up. A cool breeze from the west. Wow, clouds and a cool breeze. The burn doesn't stop. It continues all the way to Big Lake Youth Camp. The camp is preparing to shut down for the winter. The staff is cleaning up. No more camps this year. I guess I arrived at the perfect time. There is lots of hustle and bustle with staffers going every which way doing all kinds of cleaning and prepping types of activities. In the midst of all this activity there are us thru-hikers dusty, dirty, sweaty. Everyone looking haggard and gaunt. We are here for our boxes, here for snacks and soda, here for an amazing hiker box stuffed with everything a Thru-hiker needs for resupply, here because it's a distraction from the tedium of trail miles with nothing to look at but trees, plants, rocks, and trail. Always the trail, we look at the trail more than all the other stuff put together. Looking at the trail is a way to preserve our feet from pain and possibly debilitating injury. I hike into Big Lake Youth Camp with Windy, of ‘everyone knows it's Windy’ fame. Apparently when he started his hike it was windy and he kept singing that song out loud. So his fellow hikers immortalized him by granting him the name Windy. I happened to be out of water but our engaging conversation made the miles fly by and I didn't think of how thirsty I was till we arrived at the camp. Emily on staff at the camp is incredibly helpful and efficient. In the midst of all the hubbub and turmoil she was able to locate my box. “Look for purple tape and happy fruit,” was my attempt at being helpful. However she found it, she found found it. I have lunch at Big Lake Youth Camp, I mean I eat my lunch sitting at the picnic table after I sort and pack my food. My state of want and deprivation are on display when a staffer unloads a cooler of half melted ice cream sandwiches and I eat one and enjoy it in spite of how messy it is. There are lots of other Thru-hikers here. Some are taking showers, I think, “why bother?” I'm just going to be sweaty and dirty again five minutes after hitting the trail. It's time for me to leave, it's getting way too crowded. 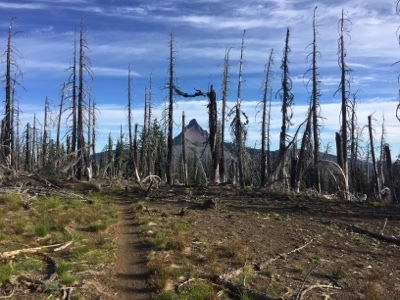 I head up the road and back to the PCT. It's hot and the trail offers minimal shade. The lowlands around the camp give way to higher ground with more trees, still not enough to make it cool. Then all of a sudden I'm back out in the sun again. Walked right into a burn zone, maybe the same one as on the way in. No shade, just gray skeletons of trees. Many have fallen. Some recently across the trail requiring a climb or walk around. The ground that is not trail is littered with branches and thick with brushy shrubs. No places to camp and way too hot to even think about. On and on it goes. It goes all the way to the pass, and beyond. I am climbing and climbing up, and further up. I realize that I left Big Lake Youth Camp without enough water. I only brought a liter. I need at least two liters to camp and have some for the next day. So much for dry camping. I need to push on to the next water source. I check the map, it's another three miles. That's an hour of hiking. So I move on. Up and up through the burned out section. Like it's never going to end, like I've been walking in it forever. Miserable and hot, I want to hike in Oregon, where it's cool, flat, and shady. Instead I'm hiking in Oregon, where it's hot, exposed, and a big long hill going up. I finally arrive at the next water and I'm immediately and immensely disappointed. It's a green pond of scummy water in the sun. I'm still in the same burned forest. The water is warm and still. Perfect for breeding all manner of bacteria and waterborne parasites. Bleeeh! No place to camp here. I filter a single liter and check my map. Four more miles to Rockpile lake. Campsites and water, hopefully better than this. I drink my liter of filtered warm water and shoulder my pack. I continue to climb up and up. Another hour and a half finds me arriving at the lake just as the sun is setting. I am so tired. I finally reached green trees! So I am hopeful for tomorrow. I find a camp under the trees and close to the lake. I gather water and cook dinner. It's dark as I climb into my tent. A long hot dusty dry day. Completely not what I expected Oregon to be like. I fall asleep hopeful that tomorrow I will see the Oregon I think of when I think of Oregon.